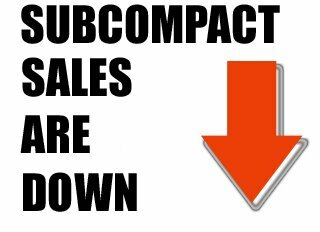 Unsurprisingly, like most vehicles, subcompact sales were down in May. • The least percentage lost from this time last year was Hyundai's Accent (-15.3%). The Accent is the only subcompact vehicle to have a positive gain overall for the year. • The biggest loser was the Scion xD, down nearly 75% from this time last year. • The biggest subcompact seller of the month was the Yaris with 10,130 vehicles sold. • The least was the Pontiac G3 with only 282 units sold. Overall, the Yaris is still the best-selling subcompact in the U.S. followed by the Nissan Versa, and the Hyundai Accent.